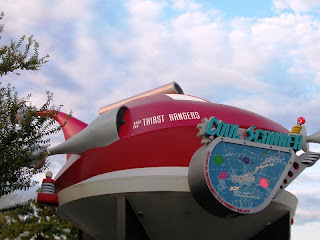 I started out with the photograph of our subject today, the Cool Ship known as Thirst Rangers that has landed above a Coka-Cola stand in the Magic Kingdom’s Tomorrowland, because I want you to take a real good look at it. Very sleek in design, wouldn’t you say? Okay, now take off the engines, and while you’re at remove the horn/radar, what looks like an air intake system atop the ship, and the dorsal fin. Do you see what I see in the layers of curves that form the hull? How about if we remove the front viewport and instead of red we paint it silver. Do you see it now? 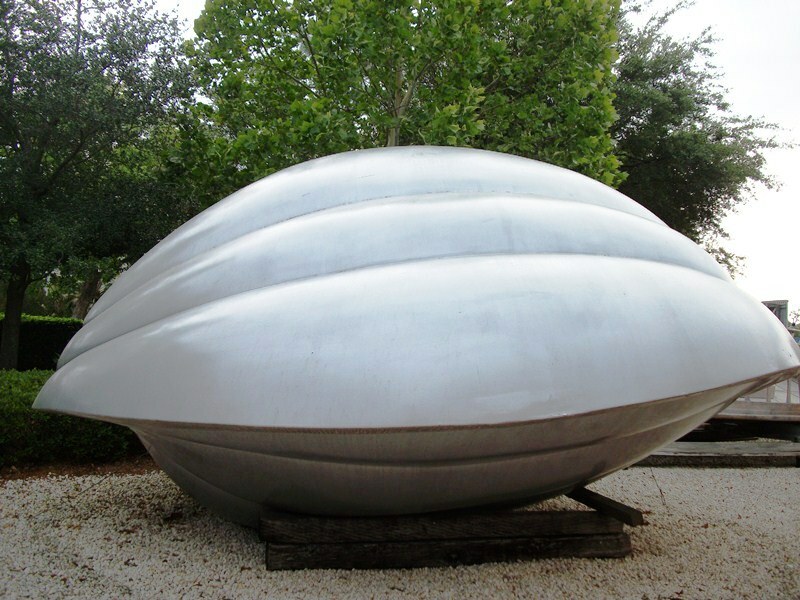 Yep, that Cool Ship is actually a Trimaxian Drone Ship from the 1986 film, Flight of the Navigator. The iconic spacecraft is most commonly recognized in its original form in the boneyard of the Studio Backlot Tour in Disney’s Hollywood Studios, but it isn’t the only ship to be found in the parks. The pair of ships spacecraft may appear to be metallic in design, but they in fact on thin sheets of wood that have been bent to the appropriate curvature. The drone ship had many different shapes in the film, depending on whether its portal was open or if it was accelerating at unheard of speeds, its most recognized shape is the one seen in both parks, even if one has received some after-market parts. While rumors may swirl about remakes, I think it is fair to say that Flight of the Navigator has a soft spot in many hearts from our formative years. It is nice to see that while some things stay the same (which we love), they can also receive new life in extraordinary ways (which we also love).